Learning does not come only from teaching in classrooms, even the brick and mortar premises of a building can also be a source of learning. As Gandhi fellows while working upon effective learning methods in classrooms of Thane municipal corporation schools we realized that apart from using textbooks and blackboards based learning, classrooms and school premises can be made more effective places where kids can play and learn. 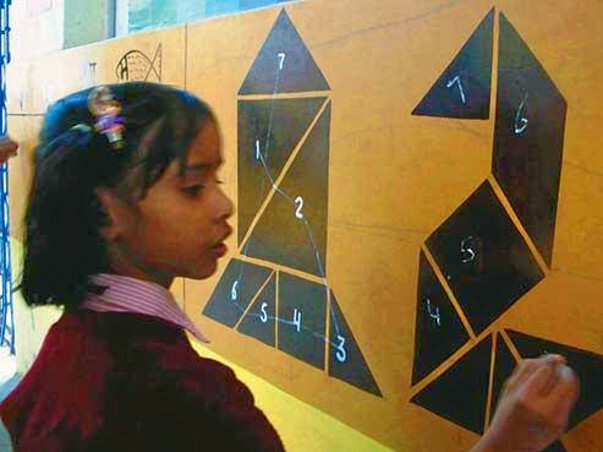 Building as learning aid (BaLa) is a concept to create an affordable learning environment for kids that can be integrated into existing spaces (walls, floors, doors ) and be actively used, with or without the presence of teachers. Through this initiative we plan raising funds to create learning spaces using BaLa in our Govt. schools in which we will build conceptual understanding in primary grade language and maths on the walls, floors and doors of school building. We request you to support us, Thanks and Regards. Good Concept. Wish to visit the school after implementation. Send me the updates in mail.